John Tierney wrote an article in the New York Times about research I previously discussed. The short story is that there are problems with the data analysis, demonstrated by Mark Liberman’s post. I showed that books don’t show the same pattern published in the original research. I’m working with the social networks in the Longitudinal Study of Adolescent Health. Students are asked to name their five best male friends and five best female friends. I’m interested in something like a measure of popularity. In-degree, the number of times others nominate you as their friend, is a simple measure, but I think I can do a bit better if I can capture the intuition that people with popular friends are themselves more popular. This is one potential use of eigenvector measures of centrality. In working with such measures, I’m learning a thing or two. For example, the weight parameter can matter a lot. I used the igraph package (see p. 8), in R to calculate Bonacich’s alpha measure of centrality for directed networks. The default weight (variable: acent) is 1. 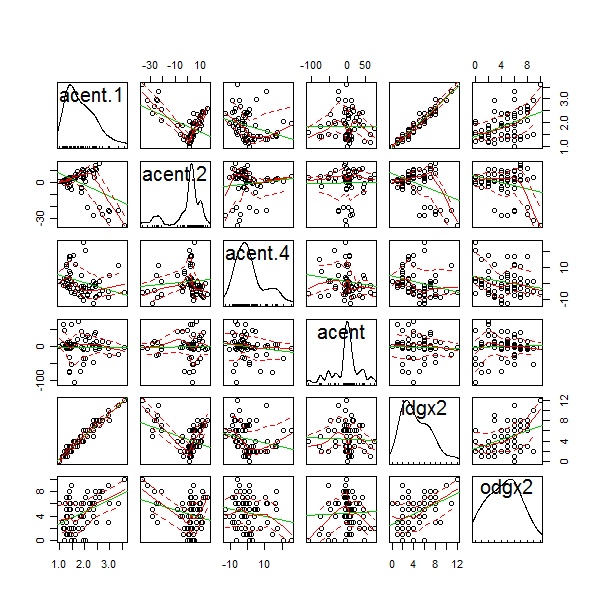 I compared this measure to in-degree (idgx2) and out-degree (odgx2) with a matrix of scatterplots and was a bit surprised not to see a clear positive relationship with in-degree. When I tried alpha weights of 0.2 and 0.4 I found fairly strong non-linear relationships due to a handful of outliers. While I think different alpha weights are worth exploring empirically, I’m inclined to emphasize ones which a positive monotonic relationship with in-degree. The reason is that, to me, in-degree itself seems like a fairly good measure of popularity or social prominence. I feel that moving to a measure quite different from in-degree requires justification in the form of strong theory or empirics. I lack both. In other contexts though, higher or lower (including negative) alpha weights might be justified. For more on applying these measures to social networks, I recommend the work of Phillip Bonacich. 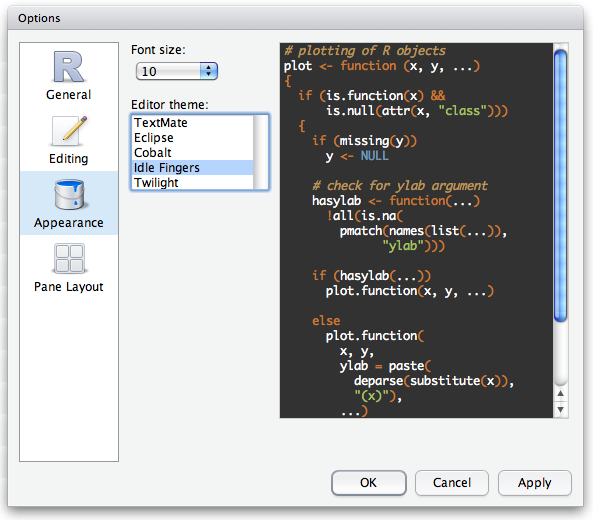 RStudio, an open-source IDE for R, was first introduced about 6 weeks ago. I wasn’t tempted, because you couldn’t place your code and its output side-by-side. They fixed that, so now I’m excitedly giving it a spin. You are currently browsing the Permutations blog archives for April, 2011.